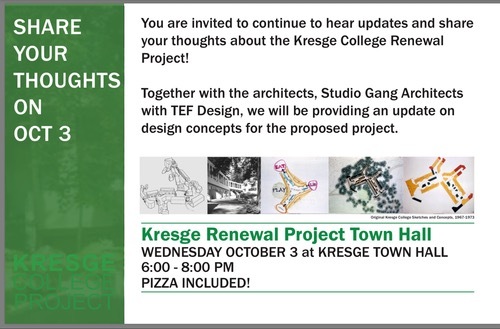 The UC Santa Cruz community is invited to hear updates and share thoughts about the Kresge College renewal project. The meeting will be from 6–8 p.m. Oct. 3 at the Kresge College Town Hall. Free pizza will be served. Studio Gang Architects, TEF Design, and campus planners will be providing updates on design concepts for the proposed project.